Happy 2nd Birthday, Outside of the Breadbox! How fitting that this is new Cake recipe just may be my favorite ever?! That may sound like a hard sell, but I'm not lying. With some 300 posts competing, I can easily award this Hazelnut Banana Cake the top spot! The recipe began with a simple plan: update my first-ever blog post with a new recipe - a recipe that would pay homage to that original creation while bringing two years of experience, including culinary school and restaurant training, to the table (pun unintentionally written but admittedly apt). The original treat was the "Drummond Monkey": an unnecessarily complicated Peanut Butter filled Banana Cupcake covered with melted Nutella and shards of Peanut Brittle. It certainly tasted good, but I was cheating. The flavors of Banana, Chocolate, Hazelnut and Peanut Butter play so well together. They can make even the most poorly executed dessert palatable. Laying myself bare, I now confess that the Banana Cake was too dense, the sticky Nutella was an untempered mess and the Peanut Butter filling was kind of kitschy. Does the world really need another filled Cupcake, or have I been watching too many reruns of Cupcake Wars? ...and yet, it still tasted good. A lot has changed on the Blog since then. Let's not even talk about the rambling text and poorly lit photos (I admit there's still room for improvement). But I knew I could make something much better. I hope you enjoy this recipe as much as I do, and I look forward to a third year for the Blog! I hope you like Hazelnuts! 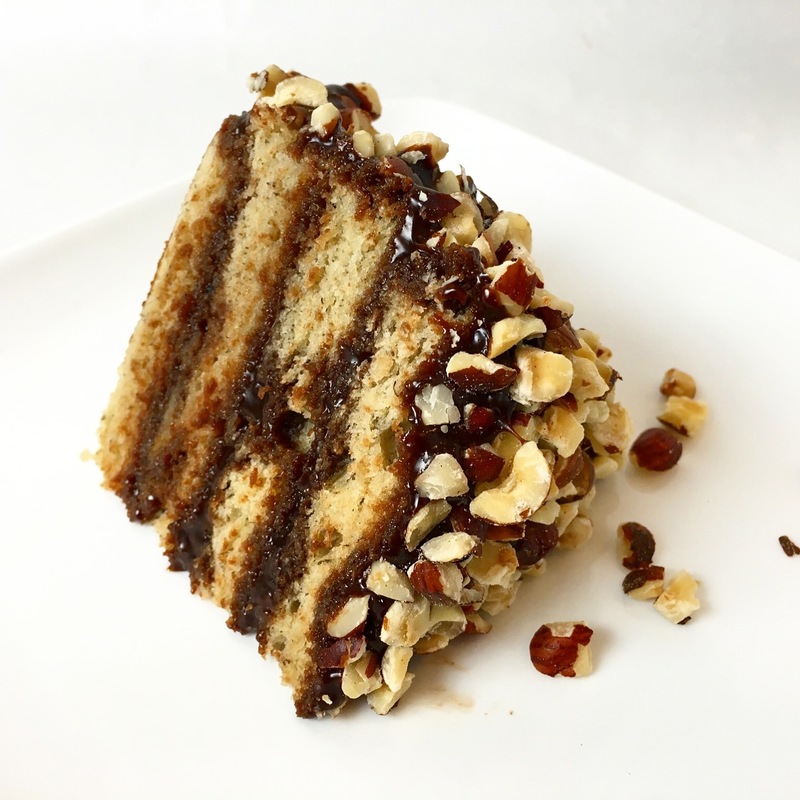 Despite appearances, this Hazelnut Banana Cake is surprisingly simple, made from just three components: Banana Cake, Nutella Chocolate Caramel Glaze and chopped Hazelnuts. This is no Banana Bread! Banana Bread is delicious, but it's no Cake. It's dense and best reserved for glee club bake sales. The biggest improvement with this Banana Cake is the texture - so much lighter. In a separate bowl, whisk together the remaining wet ingredients including the Banana Puree (i.e. nothing more than blended Bananas), Sour Cream and Lemon Juice, and set the bowl aside. Next, sift together the dry ingredients including the Flour, Salt, Baking Soda and Baking Powder. With the mixer on medium speed, alternate adding the wet and dry ingredients in thirds. Stop mixing the Cake Batter as soon as the ingredients are well combined. The Banana Cake can be baked on a half sheet tray (18" x 13") or two 13" x 9" pans. Prepare the tray or pans with a piece of parchment lightly sprayed with non-stick spray. Once the Cake Batter is fully mixed, immediately pour it onto the sheet tray (or divide it evenly between the two 13" x 9" pans) and gently smooth it with an offset spatula. 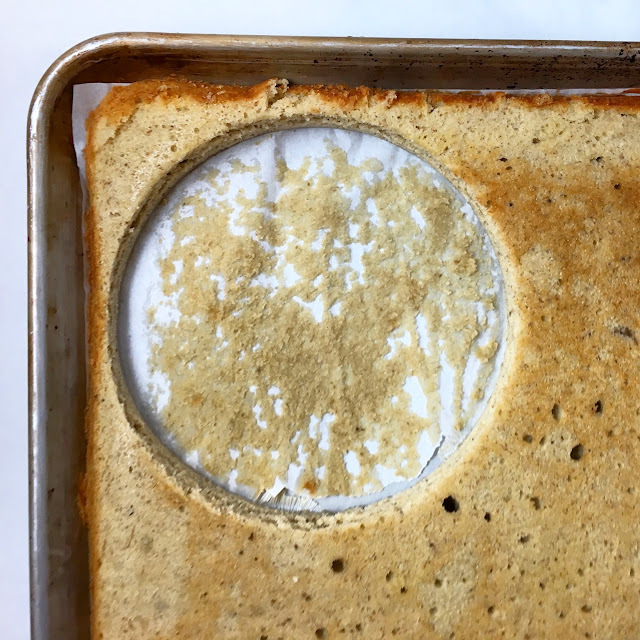 It is important to quickly fill the tray and get the Banana Cake in the oven before the gas-producing reaction from the chemical leavening stops. Bake the Banana Cake at 350 degrees Fahrenheit (177 degrees Celsius) for approximately 25 minutes or until it is lightly browned on top, springs back to the touch and begins to pull away from the sides of the tray. Set the Banana Cake aside to cool. As the Banana Cake cools, prepare the Nutella Chocolate Caramel Glaze. The recipe for the Nutella Chocolate Caramel Glaze was the product of experimentation. Why not try modifying a traditional Caramel Sauce by mixing Cocoa Powder with the Cream used to slack (i.e. thin) the Caramel Sauce and then emulsify Nutella into the finish product? Why not, indeed! The results are pretty delicious. By using less Cream than usual, and because of the addition of the dry Cocoa Powder, this Caramel "Sauce" is quite thick. At room temperature, it is barely pourable, and when it was chilled, it has more of a Ganache-like consistency. As a result, it works well as both a filling and a glaze. Make one recipe of the Nutella Chocolate Caramel Sauce and set it aside to cool and thicken. The cooling process can be accelerated by stirring the Nutella Chocolate Caramel Sauce in a metal bowl over an ice bath. Read more on basic Caramel Sauces and the Nutella Chocolate Caramel Sauce. 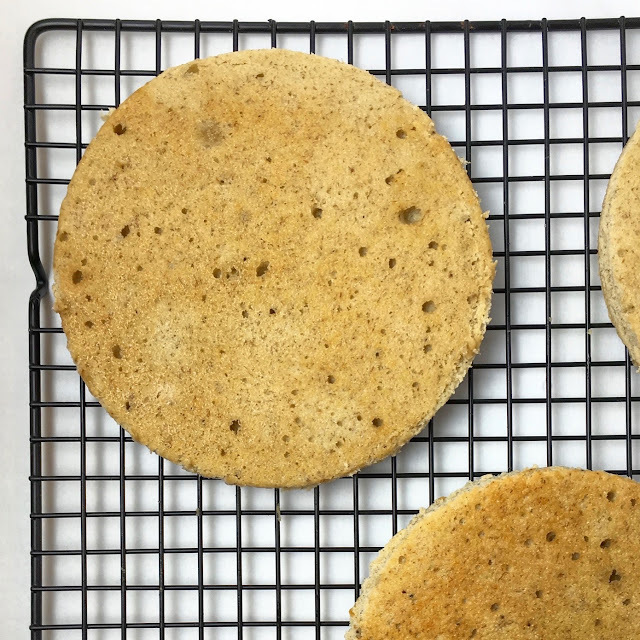 When the Banana Cake has fully cooled, cut out four 6" circles using a 6" cake ring or a paring knife. Save the scraps of Banana Cake for other projects (e.g. Cake Pops, ice cream sundae topping, etc). Assembling the Hazelnut Banana Cake is not difficult, but it can be a little messy with the sticky Nutella Chocolate Caramel Sauce. Do yourself a favor and set up a clean, well-organized work station before you begin. Place each layer of Banana Cake on a wire cooling rack over a parchment lined sheet tray. This setup will make it easier to clean any excess Glaze that drips off the layers of Banana Cake. Test the Glaze to ensure that it is of the proper consistency. It should be fluid enough so that it can easily be spooned over the layers of Banana Cake. It should not, however, be warm or so fluid that it quickly spill out over the edges (although a little spillage is inevitable and not a problem). 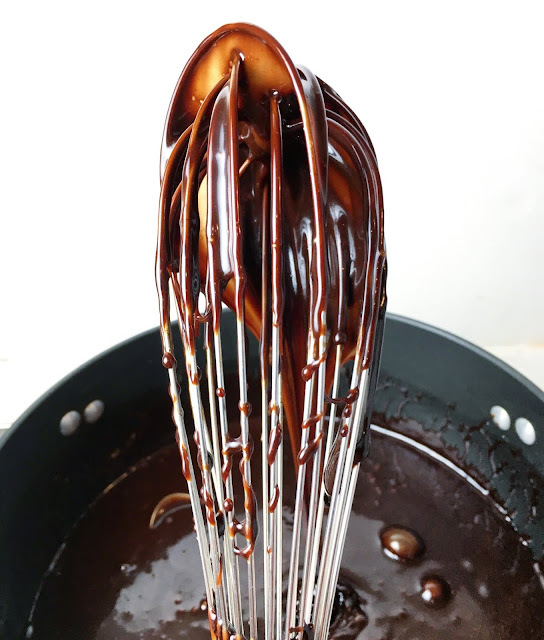 If you made the Nutella Chocolate Caramel Glaze in advance, gently warm it over a double boiler. If you just made it, cool it over an ice bath. 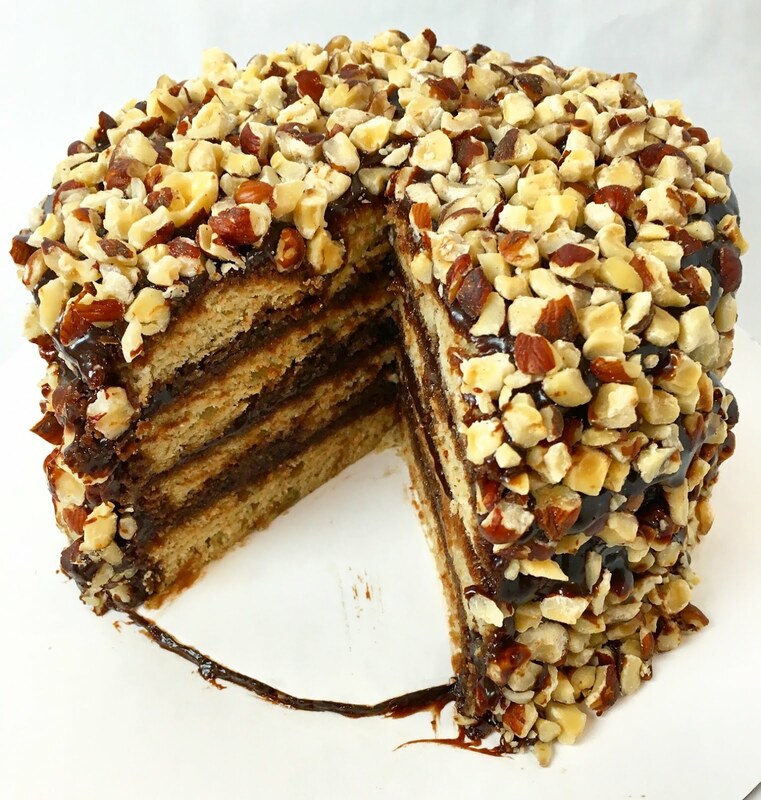 Carefully spoon a layer of Nutella Chocolate Caramel Glaze over three of the layers of Banana Cake. Stack all four layers of the Banana Cake, placing the uncoated layer on top. 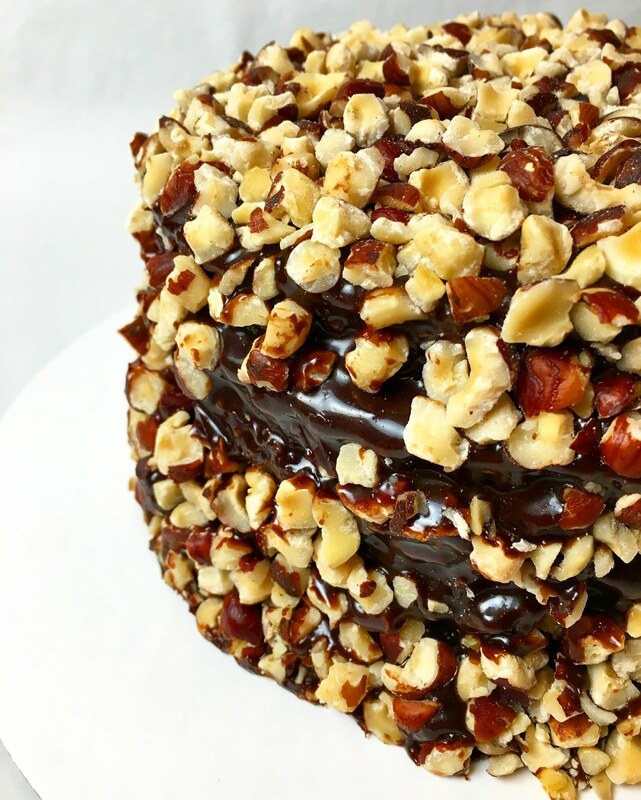 Although the Nutella Chocolate Caramel Glaze is very thick, if it is too warm and before the Hazelnut Banana Cake has set in the refrigerator, the stacked layers may shift. Do not overheat the Glaze and use wooden skewers as supports. Create supports for the layered Hazelnut Banana Cake using wooden skewers. Measure four wooden skewers against the height of the layered Hazelnut Banana Cake and trim them to the appropriate length. Insert the skewers straight down into the Hazelnut Banana Cake at evenly spaced intervals 1" from the edge. Once the Cake is secured by the supports, pour the remaining Nutella Chocolate Caramel Glaze over the layered Banana Cake. Have your camera ready if you want to capture this drippy, Instagram-worthy moment. While the Glaze is still sticky, cover the entire Cake with chopped Hazelnuts (or the chopped Nut of your choice... but Hazelnuts are the obvious, if somewhat expensive, pairing with Nutella) leaving no areas of Glaze exposed. Toasted Nuts always taste better than raw, so consider toasting the Hazelnuts in an oven at 350 degrees Fahrenheit (177 degrees Celsius) for approximately 10 minutes or until they become fragrant and just begin to take on color. When it comes to covering the Banana Cake with Hazelnuts, don't be dainty! Grab handfuls of the chopped Hazelnuts and press them firmly into the Banana Cake, completely covering the exterior. Transfer the Hazelnut Banana Cake to the refrigerator to set and chill. Once the Glaze has set, the Cake can be gently wrapped in plastic wrap. The assembled Hazelnut Banana Cake can be wrapped in plastic wrap or stored in an airtight container in the refrigerator for up to a week. The assembled Cake should not be frozen. The Hazelnut Banana Cake can be served at room temperature; however, I actually like it directly from the refrigerator. Be mindful of the support skewers inside of the Cake. While the long skewers are easily detectable in the slices, they should be removed before serving. The link to a full post on the Nutella Chocolate Caramel Glaze is provided for reference. Full recipes specifically for the Hazelnut Banana Cake are provided below. 1. Preheat the oven to 350 degrees Fahrenheit (177 degrees Celsius). Line a half sheet tray (18" x 13") or two 9" x 13" pans with a piece of parchment and lightly coat it with non-stick spray. 2. In the bowl of an electric mixer fitted with a paddle attachment, cream the Butter and Sugar until the mixture is light and airy. 3. With the mixer on medium speed, beat in the Eggs one at a time, waiting until each Egg is fully incorporated before adding the next. Continue beating the mixture until it is once again light and airy. 4. Combine the pureed Banana, Sour Cream and Lemon Juice in a mixing bowl and whisk them together until they are well combined. In a separate mixing bowl, sift together the Flour, Salt, Baking Soda and Baking Powder. Chef's Note: The Baking Soda will be activated by the acids in the Lemon Juice and Sour Cream. Once the ingredients are combined, it is important to quickly get the Banana Cake into the oven before the chemical reaction that creates the leavening completes. 5. With the mixer on medium speed, alternate adding the dry and wet ingredients in thirds. Stop the mixer as soon as the ingredients are well combined and the Cake Batter is smooth. 6. Pour the Cake Batter onto the sheet tray (or equally divide it between the two 9" x 13" pans) and spread it evenly with a large offset spatula. Immediately place the Banana Cake in the oven to bake for approximately 25 minutes. The cake is done when it is lightly browned on top, springs back to the touch and begins to pull away from the sides of the tray. Set the Cake aside to cool before removing it from the tray. - The Banana Cake can be made several days in advance and stored in the refrigerator wrapped in plastic wrap. The Banana Cake can also be frozen for up to a month. The Banana Cake can be cold when assembling the Hazelnut Banana Cake. 2. Make a slurry (i.e. a paste) with the Cream and Cocoa Powder by slowly adding the Cream to the Cocoa Powder while stirring gently. 1. Prepare the Banana Cake and let it fully cool. Prepare the Nutella Chocolate Caramel Glaze and allow it to cool to room temperature and thicken. If the Nutella Chocolate Caramel Glaze was prepared in advance, gently heat it over a double boiler until it is a pourable consistency, but still thick and not warm. 2. Using a 6" cake ring or a paring knife, cut four 6" circles of the Banana Cake. Save the remaining Banana Cake for other projects (e.g. Cake Pops). Place each layer of Banana Cake on a wire cooling rack over a parchment lined sheet tray. 3. 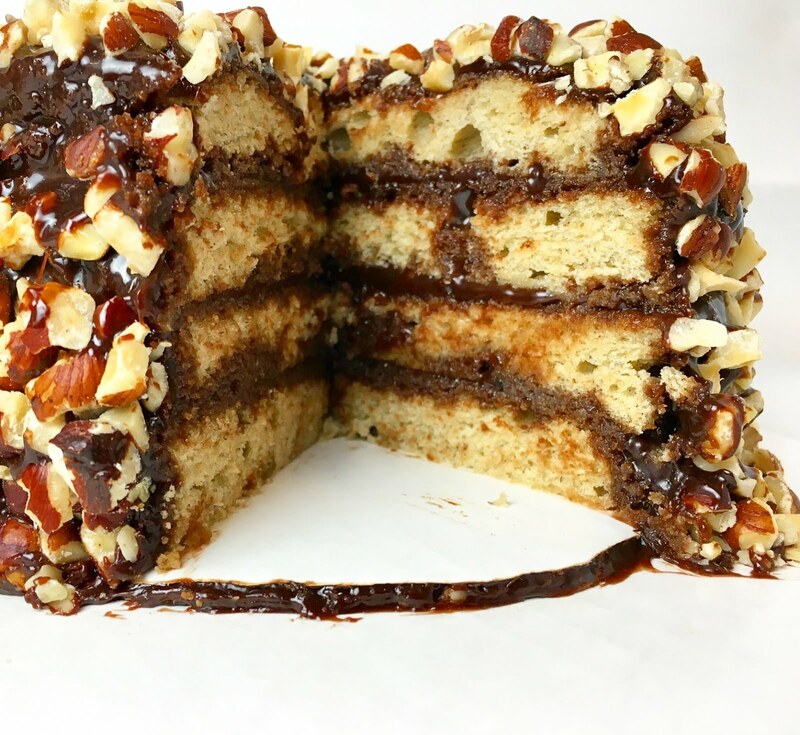 Carefully spoon a layer of the Nutella Chocolate Caramel Glaze over three of the layers of Banana Cake. Stack all four layers of Banana cake, placing the unglazed layer on top. Chef's Note: While the Nutella Chocolate Caramel Glaze is very thick, when warm and before the assembled Hazelnut Banana Cake has time to set in the refrigerator, the layers may shift. Do not overheat the Glaze and use wooden skewers to create supports. 4. Create supports for the layered Hazelnut Banana Cake using wooden skewers. Measure the wooden skewers against the height of the layered Hazelnut Banana Cake and cut them to the appropriate length. Insert the skewers straight down into the Hazelnut Banana Cake at evenly spaced intervals 1" from the the edge. 5. Pour the remaining Nutella Chocolate Caramel Glaze over the layered Banana Cake. While the Glaze is still sticky, cover the entire exterior of the glazed Banana Cake with the chopped Hazelnuts leaving no areas of Glaze exposed. Transfer the Hazelnut Banana Cake to the refrigerator to set and chill. Once the Glaze has set, the Cake can be gently wrapped in plastic wrap. 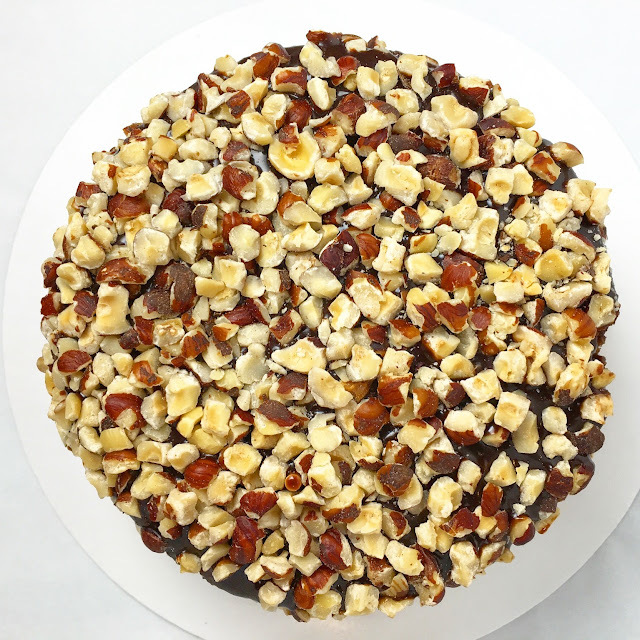 - The assembled Hazelnut Banana Cake can be wrapped in plastic wrap or stored in an airtight container in the refrigerator for up to a week. The assembled Cake should not be frozen. - Serve the Hazelnut Banana Cake either directly from the refrigerator or tempered to room temperature. - Remove the supports from the slices before serving. This looks INCREDIBLE! I am saving this recipe for sure, my family will LOVE it!